The Board of the ESSWE invites proposals for hosting the Fourth Biennial Conference of the ESSWE in 2013. Proposals should be emailed to the Secretary, Mark Sedgwick, mjs@teo.au.dk, by 1 June 2011, and should cover: 1. The location of the conference. What rooms would be available for large sessions and small sessions, what possibilities are there for coffee breaks and lunches and so on. Could there be special arrangements with one or more hotels to provide special rates? 2. Finances. What possibilities are there of funding to invite keynote speakers--that is, to pay for their flights and accommodation? How much, for how many speakers? What sort of fee would participants be charged? 3. Anything else of importance that would contribute to a successful conference, or be an issue that would have to be addressed. The Partington Prize 2011 The Society for the History of Alchemy and Chemistry has established the Partington Prize in memory of Professor James Riddick Partington, the Society’s first Chairman. It is awarded every three years for an original and unpublished essay on any aspect of the history of alchemy or chemistry. The prize consists of five hundred pounds (£500). The competition is open to anyone with a scholarly interest in the history of alchemy or chemistry who, by the closing date of 31 December 2010 has not reached 35 years of age, or if older has completed a doctoral thesis in the history of science within the previous three years. Scholars from any country may enter the competition, but entries must be submitted in English and must not have been previously submitted to another journal. The prize-winning essay will be published in the Society’s journal, Ambix. One hard copy of the entry, word processed on one side of the paper, should be submitted, along with a copy of the entry on disc. We prefer files to be in Microsoft Word XP, if possible. Essays must be fully documented using the conventions used in the current issue of Ambix. Essays must not exceed 10,000 words in length, including references and footnotes. All entries must be submitted with a word count. All entries should be sent to John Perkins, Hon Treasurer, Centre for Health, Medicine and Society, Oxford Brookes University, Gipsy Lane, Headington, Oxford OX3 0BP, with the words “Partington Prize” written clearly on the envelope. Each entry should contain a separate title page giving the author’s name, institution, postal address, email address and date of birth (and if relevant the date of completion of their thesis). The author’s name and contact details must not appear on the pages of the essay as the identity of the author will not be made available to the judges. Essays (no more than one from each competitor) must be received no later than 31 December 2010. The decision of the judges appointed by the Council will be final. The Society reserves the right to divide the prize between two or more entries of equal merit, or not to award a prize should no essay be deemed of suitable standard. The name of the winner will be announced by 30 April 2011, and all essays will be returned to competitors soon after that date. 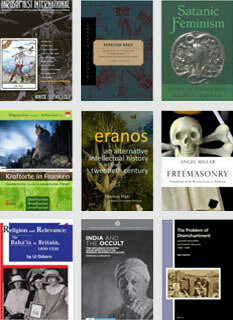 We invite articles for a forthcoming book, _Esotericism, Religion, and Politics_, the third volume in the Studies in Esotericism series, this one focusing on the political implications or aspects of esoteric religious groups, figures, or movements. What are the political associations of particular figures, groups, or movements within Western esotericism? In what senses can a particular esoteric figure or movement be seen as political? Some modern authors, for instance, Julius Evola, and indeed many affiliated with Traditionalism, often are identified as politically to the Right. Is there an esotericism that lends itself to the Left? What does it mean to say that a given religious figure or group within Western esotericism is "radical"? How have charges of magical practice been allied with political accusations against minority groups, and in what ways? Are there political implications for particular variants of mysticism? We expect that articles will offer insight into the political implications of historical or contemporary aspects of Western esotericism. We anticipate that, like the previous volumes in the series, this one will be divided into thematic sections that might include "Magic," "Mysticism," "Traditionalism," or "New Religions," to give only some examples. Articles should be submitted with endnotes, and according to the Chicago Manual of Style in most regards, and if any illustrations are proposed, they should be submitted as separate 300 dpi .tiff files. Authors are responsible for obtaining permission to publish any images. 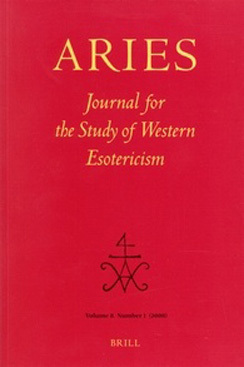 You can find details on previous volumes in the series, and updates on this current book in the series, at www.aseweb.org or www.esoteric.msu.edu Please send formal proposals (a paragraph or two with a title is sufficient) for possible relevant articles to by February 15, 2010. Completed articles proposed for the volume are due by August 15, 2010, and should be sent as electronic files to , with a cc: to Arthur Versluis at versluis (at) msu.edu, to whom relevant queries may be directed. Robert Collis receives the ESSWE Thesis Prize for 2007-09 for an outstanding European Ph.D. thesis on Western Esotericism, “The Petrine Instauration: Religion, Esotericism and Science at the Court of Peter the Great, 1689-1725”. Dr. Peter Forshaw has been elected as Assistant Professor for the History of Western Esotericism in the Early Modern period. He will succeed Dr. Kocku von Stuckrad who moves to the University of Groningen as Professor of Religious Studies. Dr. Forshaw's appointment at GHF will begin on september 1, 2009. Peter Forshaw researched his doctorate in Intellectual History at Birkbeck, University of London, and was then awarded a British Academy Postdoctoral Fellowship for research into the history of early modern magic. He is currently an Honorary Research Fellow in the Department of English Studies at the University of Strathclyde, a Research Fellow in the Department of History and Philosophy of Science, Cambridge, and Honorary Fellow in the University of Exeter's School of Humanities and Social Sciences, and in the School of English and Humanities at Birkbeck. He is co-convenor (with Stephen Clucas) of EMPHASIS: Early Modern Philosophy and the Scientific Imagination Seminar, which has been held monthly during the academic year in the Institute of English Studies, London, since 2003, and is elected council member and webmaster of both the Society for Renaissance Studies and SHAC: The Society for the History of Alchemy and Chemistry. Peter's research focuses on the confluence of learned magic, science and religion in early modern Europe. At Strathclyde he has been working with Professor Jonathan Sawday on the 'Art of Fire', a project investigating the sixteenth- and seventeenth-century alchemical and magical works in The James Young Collection at the University of Strathclyde. In Cambridge he has been working with Dr Lauren Kassell and Dr Rob Ralley on The Casebooks Project: An Edition and Database of Simon Forman's and Richard Napier's Astrological Casebooks, 1596-1643. He is preparing a book The Mage's Images: Occult Theosophy in Heinrich Khunrath's Early Modern Oratory and Laboratory, for Brill's Studies in Intellectual History.